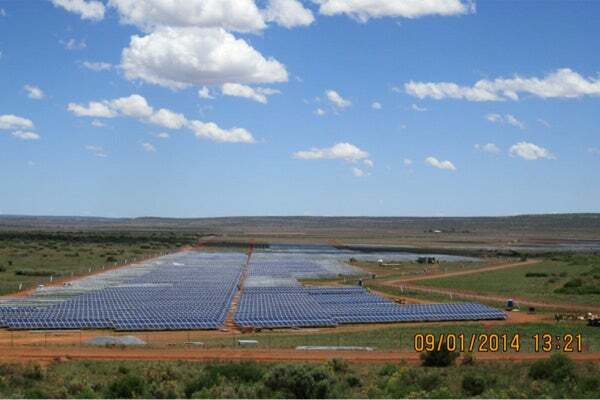 The 96MW Jasper solar power project is located in Northern Cape Province of South Africa. The Jasper photovoltaic power plant comprises more than 325,000 multi-crystalline modules supplied by Yingli. The solar power plant was estimated to involve an investment of $260m. Jasper solar power project is a 96MW solar photovoltaic (PV) power plant located in Northern Cape Province near Kimberly in South Africa. The plant became the biggest solar power installation in Africa when it came online in October 2014. The project was developed by California-based solar developer SolarReserve and its consortium partners Kensani and Intikon Energy. Construction of the plant started in October 2013, while full commercial operations began a year later. The project is designed to operate for more than 25 years. The plant generates 180GWh of clean, renewable energy that is sufficient to power more than 80,000 homes in South Africa. It is expected to offset 145,891t of carbon dioxide every year from the atmosphere. The Jasper solar power project is located adjacent to the 75MW Lesedi solar PV power plant, which began commercial operations in May 2014. "The Jasper solar project is spread over in 180ha and comprise of more than 325,000 Yingli YL295P-35b multi-crystalline modules with a peak power rating of 295W." The Jasper solar project is spread over in 180ha and comprises more than 325,000 Yingli YL295P-35b multi-crystalline modules with a peak power rating of 295W. The plant also features 78 INGECON® SUN PowerMax central inverters with 1MW AC rated power. The inverter is equipped with an advanced air cooling system, which helps in providing 1,019kW of peak power at temperatures up to 45ºC. The inverters include a group of radial fans that provide air circulation inside the equipment, increasing its performance. South African Department of Energy initiated the Renewable Energy Independent Power Producer Procurement Programme (REIPPPP) to fulfil its commitment of developing 8,400MW of solar PV energy by 2030. The consortium of SolarReserve, Kensani and Intikon Energy was awarded the Jasper project in the second round of the REIPPPP. It is the third project being undertaken by the consortium after the Lesedi and Letsatsi solar photovoltaic power plants which have an installed capacity of 75MW each. "Apart from generating clean sustainable energy, the Jasper solar power plant also promotes economic development and helps in job creation." Apart from generating clean sustainable energy, the Jasper solar power plant also promotes economic development and helps in job creation. It generated approximately one million man-hours during construction, peaking at more than 800 on-site construction jobs, and has created 50 permanent and operational positions, in addition to a number of indirect and induced jobs. The project also planned to set aside a portion of the total projected revenues for promoting the enterprise and socio-economic development of the surrounding regions. The entire power generated at the Jasper solar power project is sold to Eskom, South Africa’s state-owned power utility, under a 20-year power purchase agreement. The total investment on the Jasper solar power plant was estimated to be ZAR2.3bn ($260m). Kensani Eaglestone Capital Advisory acted as the financial adviser for the project. The project was financed through a combination of equity and debt. The equity investment was made by a group of companies including Google, the Public Investment Corporation (PIC), Kensani Capital Investments, SolarReserve, Intikon, Development Bank of South Africa, and the P.E.A.C.E. Humansrus Fund. Rand Merchant Bank also partly financed the project and also acted as the sole mandated lead arranger for the debt funding requirements. Baker & McKenzie acted as the legal advisor for the financing. The construction contract worth $150m was awarded to the consortium of Iberdrola and South African company Group Five. The contractual scope also included the plant development, the transformer substation and a 132kV overhead power line, feeder lines, as well as plant operation and maintenance over the next 15 years. Iberdrola subcontracted Yingli Green Energy for the supply of the PV modules. Ingeteam is the supplier of inverters, and control system for the Jasper PV plant.